Totally destroyed by the Atomic bomb the city has been completely rebuilt and is now a modern and thriving metropolis built around a memorial Peace Park which is a permanent reminder of the horror of the Atomic blast. A visit to this park is a must for every visitor to Japan. The A Bomb Dome is left as it was immediately after the atom blast. Its twisted ruins will be left for all time as a reminder of the explosion. The A Bomb Museum contains graphic exhibits showing Hiroshima before and after the blast. A filmed presentation on giant screens shows the attack from cameras on the American planes. 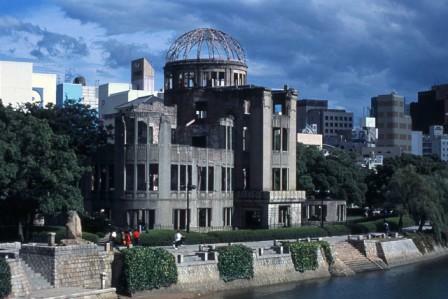 Hiroshima is dedicated to preventing the use of atomic weapons for all time. Only a short train and ferry ride from Hiroshima. It is one of the three most beautiful islands of Japan. From the top of Mount Misen, the highest point of the island , there is a breathtaking view over the Inland Sea of Japan to the Japanese mainland. In Autumn and Spring the island is famous for the colours of the maple and cherry trees which grow wild on the island. Tame deer wander all year among the visitors.